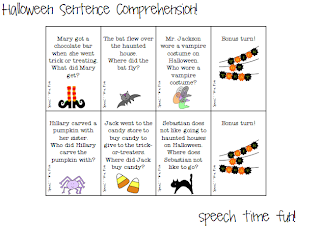 Speechie Freebies: Halloween Sentence Comprehension! Have fun working on auditory comprehension at the sentence level and answering questions with this fun, Halloween themed card game! Hop on over to my blog by clicking HERE to check it out and grab it!